The earlier piece (Goswami’s Quantum Philosophy I) was an overview of his interpretation of what quantum physics means philosophically. That overview can be briefly summarized using the analogy introduced in Part I. Think of a computer with a huge amount of RAM or working memory. Within this “working memory” there is nestled a small reserved area, which might be thought of as having a shell that partitions it off from the rest of working memory. Within this reserved area there is a self-evolving virtual reality program running. The program has to follow certain rules, which impose limits on what it can produce but still allows a number of degrees of freedom for its operation. From the sheltered perspective of the virtual reality program, the reality created by the program is all there is and the vast field of “working memory” within which it runs goes largely undetected. Think of the huge “working memory” as the unified field of consciousness (UFC), the shell around the reserved area as space/time, the self-evolving virtual reality program as the materialist model of reality and the rules that govern the operation of the program as classical (Newtonian) physics (see first Figure, in P1). Part II will look at the relationship of quantum waves of possibility in the UFC and the manifestation of human beings as objects in the material world. The following analogy from Part I will provide a brief review of the collapse of quantum waves of possibility (see second Figure, in P1). Imagine that a wave of possibilities is like a rapidly spinning loop of images, where there are 6 images of A, 5 images of B, 4 images of C, 3 images of D, 2 images of E and 1 image of F. The varied number of copies of each image represents the probability for that image. Thus, if one slows down the loop until one image alone comes into focus, you have the collapse of the wave of possibilities. Statistical determinism tells us that the image that becomes the focus is most likely to be image A (p = .30) but could be image F (p = .05). The loop (wave) has taken on the appearance of a single frame (particle) or collapsed possibility wave. However, recall that one has only slowed down the loop, not frozen it. Thus, the loop (wave) is still progressing (spreading) but in very slow motion. Whether you or other observers will ever detect this slow movement depends upon how long and with how much precision you observe the image. Even though one now observes only a single frame, that frame still retains a “hidden” connection to the loop, which means it still retains a connection to the wave of possibilities from which it collapsed. Every person past, present and future is represented in the UFC as a wave of possibilities, a transcendent consciousness or quantum monad. Each of those consciousnesses will vary depending upon previous entanglements with the material world. In all cases, a transcendent consciousness represents far more aspects than could be manifest in a single collapse. Thus, a given collapse from a transcendent consciousness consists of selected aspects of that consciousness. Recall from the analogy above concerning wave collapse, that even following collapse there remains a connection to the wave of possibilities from which the collapse originated. As a collapse linked to a physical manifestation takes place, it unfolds in graduated stages from the Oversoul or bliss body, which is grounded in transcendent consciousness. The manifestation that begins with the bliss body ends with a material representation or physical body. One aspect of a material manifestation is referred to by Goswami as the supramental intellect or theme body. This subtle (non-material) body imposes the broad outlines for the manifestation. These themes are similar to what Jung called archetypes. Another aspect of a manifestation is the mental body. The mental body is a suble body somewhat like a dictionary of meanings necessary for thought and feeling. The vital body is the last of the subtle bodies. The vital body contains the necessary forms for the manifestation. The biologist Rupert Sheldrake has proposed a similar function in biology that is carried out by what he refers to as morphogenic fields. 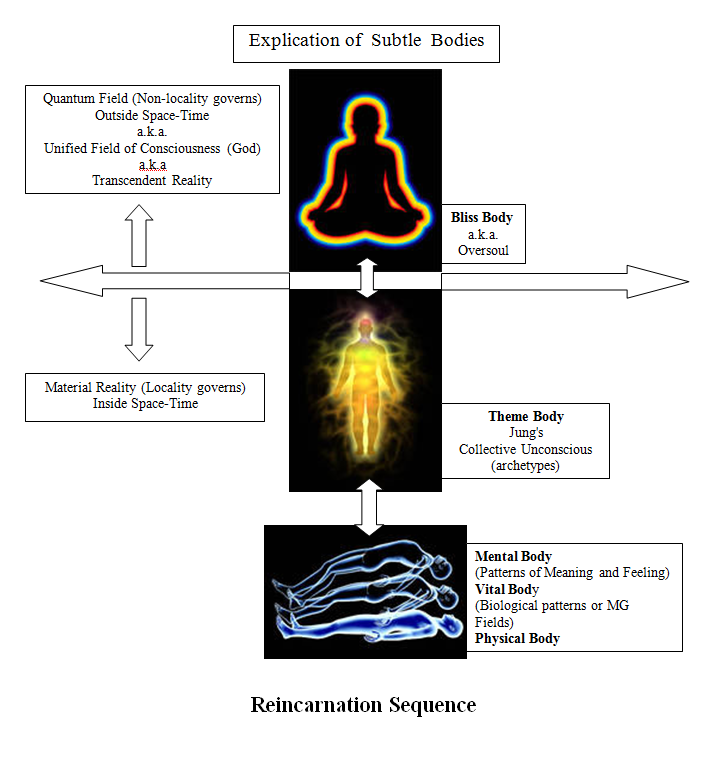 Finally, as the collapse is completed the physical body is articulated by its connections to the subtle bodies (see Figure below). Thus, the structure of the physical body is controlled by the “blueprints” in the vital body being mapped onto the physical body. The mental body “writes” or maps its program onto the brain, making possible the meaningful processing of experience. The theme body provides broad parameters within which experiences are understood and related. The theme body, however, is not mapped onto the brain. Running throughout is the original thread of consciousness that began in and is still tethered to the bliss body. Only the physical body is a temporary abode for consciousness. The theme, mental and vital bodies comprise what Goswami calls a quantum monad, which is a permanent feature of the bliss body (a.k.a. Oversoul). Using a different frame of reference, the quantum monad could be thought of as essentially equivalent to the religious concept of soul. There are important differences, however, between a quantum monad and a soul. Generally, the term soul is used to refer to an individual spiritual entity that has an existence independent of God as well as of matter. A quantum monad on the other hand is an integral part of a unified whole. The unified whole in which a quantum monad resides is in religious terms God. Thus, the traditional view of the soul is a dualistic conception that has each and every soul standing alone and separate from God and from the material world. The quantum view of the soul is a monistic conception in which each soul is merely an aspect of God as is the material world. In the quantum view the soul’s separateness or independence from God is merely an illusion. A persistent illusion but an illusion nevertheless. What then might we learn of the soul by examining the probable characteristics of the quantum monad? In part one, ego identity and the idea of conditioning was discussed. Classical memory is the basis for conditioning and is an essential component in the process whereby one comes to have strong response predispositions. These response predispositions limit our choices from the broad range of possibilities that are always before us. At any given time we are free to make any of the choices available in the flow of consciousness. However, conditioning makes habitual choices the most likely. One outcome of conditioning of choices is that in the aggregate they come to form patterns. What we often call character in a person is related to the patterns that have come to dominate his or her thoughts, feelings and actions. Such general patterns are impressed upon the quantum monad through what Goswami calls quantum memory. The particulars of classical memory are not preserved in the quantum monad but the general patterns derived from experience are preserved by quantum memory within the monad. For any individual consciousness an essential goal is to learn through experience that it is an integral component of the UFC or an extension of God, that is, to achieve enlightenment. Once that goal is met the individual consciousness is enfolded into the UFC and returns to a state of unity with God, enriching the whole in the process. Accepting unification of an enlightened consciousness with the UFC as a goal, it is clear that achieving such a goal is unlikely in a single lifetime. Goswami argues that this would necessitate what is known in religious terms as reincarnation. What is reincarnated is a quantum monad while the experiences and knowledge of the incarnated quantum monads is accumulated in the Oversoul. Goswami’s proposed quantum monad is capable of quantum memory and thereby will retain memories of prior incarnations. These will not be memories in the classical sense, such as recalling how to tie a shoe or speak French. Access to classical memories from previous incarnations is possible through the principle of non-locality, which operates outside of space and time. However, access to classical memories from previous incarnation through non-local connections is relatively rare. Usually, the operative memories will be quantum memories of general patterns such as character traits like generosity or jealousy, of talents such as music or mathematics or of behavioral tendencies such as risk taking or phobias. Many such patterns are acquired through the experiences made possible by physical manifestations or incarnations. It is from these quantum memories that consciousness chooses what to make manifest through the quantum monad when a new incarnation is undertaken. The patterns held in quantum memory are in religious terms known as karma. Unless an Oversoul has liberated itself from the need for physical manifestations, it will repeatedly incarnate quantum monads until it achieves liberation through enlightenment, which requires an awareness, through direct experience, of one’s unity with God. In the non-liberated, Consciousness identifies opportunities for physical incarnation that have a strong correlation with associated karmic patterns comprising a thread of karmic need within a given Oversoul. In other words, a developing physical form that has the biological foundations (for example gender and temperament) and the situational circumstances (for example ethnicity and nationality) to support in whole or large part the karmic thread identified. The incarnated quantum monad subsequently comes to articulate the selected physical form. Some aspects of the collapse associated with the vital body can begin quite early. However, there can be no mapping of the mental body, which in traditional religious terms is most closely associated with the idea of a soul, until the brain has formed. Thus, the mental body begins mapping onto the brain after about six months of development. Karma or quantum memory influences current incarnations by biasing the probability that certain choices will be made within a given context. In short, the conditioned response biases acquired in one incarnation can be carried across into a new incarnation. For example, if one had developed a pattern of responses that might be called jealously in one incarnation, Consciousness may choose to manifest that pattern through the quantum monad in the next incarnation. Therefore, an individual on to whom a bias toward jealousy has been mapped will in suitable contexts be predisposed to make habitual responses associated with jealousy. The purpose is to provide the individual with opportunities to rise above this obstacle to enlightenment. The converse would be true for a more positive pattern such as a musical talent. Having such a talent mapped onto the physical manifestation will increase the probability that one will make choices that create appropriate contexts for further developing the talent. The purpose is to exercise the ability and make positive use of the creative energies available through Consciousness. Thus, unless a consciousness has no previous incarnation, each incarnation brings with it a collection of patterns or karma accumulated during prior incarnations. In other words, an opportunity has been created for one to overcome negative patterns and to creatively enhance positive patterns. Karmic patterns impressed onto a correlated physical form in a selected situation do not impose outcomes. They set the conditions that are likely to lead to certain types of learning opportunities. Habitual response patterns predispose one to respond in a certain way to those situations. Because of free will, there is always the possibility that one will choose a less probable response that is a more positive response to a given circumstance. This entails being creative in the face of a challenge rather than habitual or reactive. Repeated success in exercising free will to make better choices will result in a change in the conditioned pattern and thus in one’s karma. Free will is possible because of a brief grace period between the eliciting of a conditioned response and the actual response. Studies have shown that when a stimulus is presented, it is processed in the unconscious (i.e., beneath conscious awareness). The habitual pattern of response will predispose one to make the most probable response, which is to follow the path of least resistance. However, between the unconscious response and the physical implementation of this response there is a very brief delay. It is this delay that opens the door to free will. Through this brief window there is an opportunity to deliberately choose an alternative response from the possibilities that exist within consciousness. Of course, one might choose a worse or an equally bad response but one can also choose a better response. Better in the sense that it weakens rather than reinforces the negative pattern. Free will and creativity are the tools available for working on one’s character or karmic patterns. Neutralizing negative karma and building positive karma opens the possibility for enlightenment. Ego is the persona that embodies our habitual patterns of thinking, feeling and acting. It is a mask behind which we hide and with which we identify so closely that we are blind to our true nature. The single biggest obstacle to liberation is ego. Stripping away this mask is an essential step in changing our character. Birth and death are complimentary aspects of the karmic cycle. Death is the end of one wave in the cycle and usually the antecedent for the next wave in the cycle. Death is simply withdrawal of consciousness from a degraded physical form, a form that has served its purpose as a temporary vehicle for experience in the material world. Death is a phenomenon of the material world and therefore an illusion. The UFC and the Oversouls within it are immortal and eternal as are the quantum monads or souls within it. Death is also an exceptional window of opportunity. It says in the Tibetan Book of the Dead that a conscious death is a process that can lead to liberation (see also The American Book of the Dead). As consciousness withdraws from the physical body, it is possible through non-locality to become fully aware of all of one’s past incarnations and the obstacles that need to be overcome. In this moment of total clarity and spiritual joy, enlightenment is possible. Conscious dying requires preparation and intent for which guidelines exist. *This interpretation of Goswami’s thinking is based solely upon my understanding of Goswami’s writing and is largely based upon his book titled Physics of the Soul, which I recommend to anyone who wants to pursue his reasoning more deeply.